The suspects are Solomon Lamptey aka Okelebe Attah Quaye, 27 years old; Eric Arye aka Okukuseku or Pump Action 22 and Enoch Lartey aka Pome, 24. 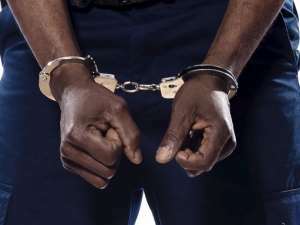 The Accra Regional Police Public Relations Officer, Assistant Superintendent of Police (ASP) Efia Tenge, confirmed to DAILY GUIDE that the three men are suspected to be those who had been attacking residents of the area in recent times. Reports from the Odorkor Divisional Police Station, under which command Gbawe is, indicated that there had been a series of reports of motorbike snatching, attacks on mobile money vendors and other forms of crime in and around Gbawe. Through police intelligence, Solomon Lamptey was arrested and brought to the station for interrogation. While being interrogated, he mentioned Eric Arye and Enoch Lartey as his accomplices and so they were subsequently arrested. Further investigations revealed that Lamptey single-handedly snatched six motorbikes from their owners at different locations in Accra. He further mentioned other persons whom he had been operating with; and efforts are underway to get them arrested.